Tired of the tick, tick, tick? Replace your HLAs. So just how do the HLAs work? The concept is a self adjusting thickness lifter that keeps the lifter in contact with the cam shaft and top of the valve at all times. Intentionally these HLAs (Hydraulic lash adjusters) are designed to let oil flow in between the inner and outer plunger assembly in only one direction. The oil pump pushes oil past the check ball in the inner plunger. This oil pressure (combined with the plunger spring pressure) pushes the outer plunger away from the inner plunger, which makes the HLA grow taller (the outer plunger pushing down against the valve, and the inner plunger pushing the lifter body towards the cam shaft.). The cam shaft lobe pushes down on the lifter body, which transfers that force to the inner plunger. This reverse pressure tries to force the oil between the inner and outer plunger back out the hole in the center of the inner plunger but there is a check ball that shuts from the pressure. The oil has nowhere to go. The two plungers fit together so closely that the oil can’t even squeeze between their walls The two plungers are in hydraulic lock and the cam shaft forces the valve open by pushing all the cam force through the oil trapped between the plungers. The problem is the oil never gets out and is trapped inside the built in reservoir on the top of the HLA so it is ready to enter back in between the plungers. 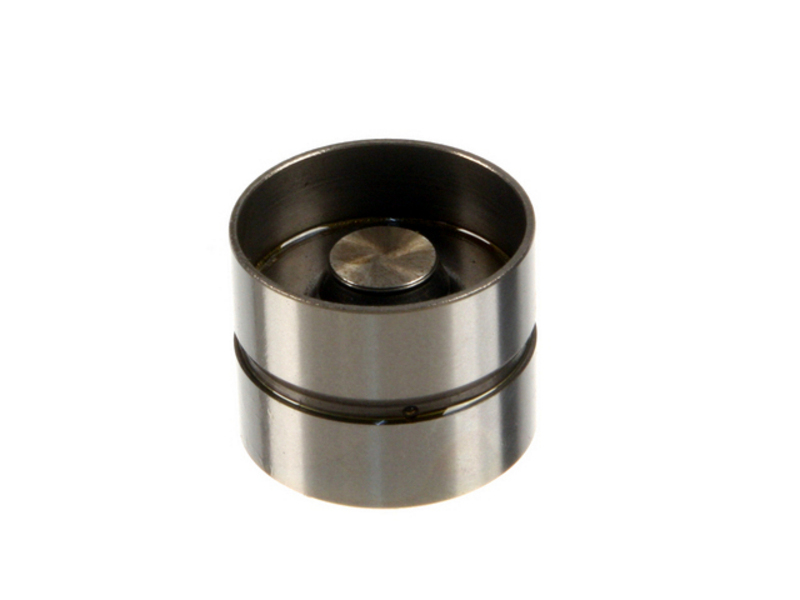 The HLA reservoir top is designed just like plungers, one little hole flowing oil in (under oil pressure) and no holes out. So this oil is essentially stagnant inside the HLA. Eventually the oil breaks down and can turn to sludge inside the HLA so that the oil pump can’t force enough oil in through the three small holes and past the check ball to ensure that the chamber in between the plungers stays pressurized. Not enough oil pressure means that the chamber between the plungers shrinks by enough to allow a small space between the valve and lifter or cam and lifter. This small space allows the metal to impact metal making our favorite HLA “Tick Tick Tick” noise. We recommended replacement if your engine has frequent valve chatter especially on high mileage motors. Includes all 16 lifters.